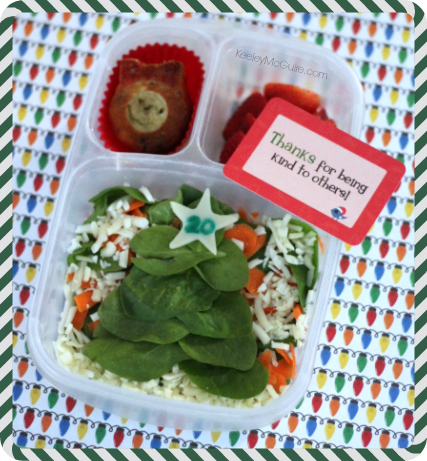 We made an "Oh Spinach Tree" lunch in 2011 and I thought it would be fun and festive to do another play on it again. I made a base of spinach and carrot salad. I chopped up shredded mozzarella cheese for her in small dices so it would look like snow falling around the tree and on the “ground”. I then did a layer of spinach leaves shaped into a tree and added a star on top with our countdown number, written with food safe marker. Also packed is a gluten & allergy friendly muffin bite shaped into a Christmas wreath and strawberry slices.